Sink Tip lines are a combination of a floating running line and a 6' to 20' tip that sinks. The tips vary according to the sink rate classification. The advantages of the Sink Tip is that you can easily pick up the line after casting and you have more line control once the cast is made. The Sink Tip lines are primarily used in large stream applications. Currents and the length of your sink tip will vary the depth at which the sink tip can reach. The Sonar Sink Tip is ideal for streamers and wet flies for steelhead, salmon, and bass in moving water. It has a longer taper providing easy turnover, better presentation. A braided multifilament core and sink tip rates of Sink 3 (2.50 – 4.25 ips) in 4-8 wt. and Sink 4 (3.75 – 5.25 ips) and Sink 5 (5.50 – 6.50 ips) in 5-8 wt. The Frequency Sink Tip is ideal for streamers and wet flies for trout, steelhead, salmon, and smallmouth bass in moving water. It has a fast-sinking 10’ tip that sinks flies through the water column and a mid-length head that enhances control.Sink Rates: 2.5 – 4.0 ips (Type III). The Sonar Clear Tip loads quickly and delivers the biggest flies to the furthest targets with a 15′ clear tip for stealthy presentations and an excellent turnover due to the short, powerful head and short front taper. 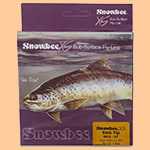 Slow sink rate gets flies just below the surface, Sink Rate: 1.25 ips (Intermediate). The Stillwater Emerger Tip is designed specifically for the demands of stillwater anglers based on popular MPX taper. Overweighted by a full line weight for multiple flies and long leaders, it has a 5-foot clear intermediate tip (1.25 ips) with floating running line and head for fishing flies just below the surface. Features all-new supple clear material for reduced memory. Cortland’s 444 Classic Sink Tip 6 line features a 10-foot fast-sinking tip for fishing streamers, nymphs and other subsurface flies in deeper water and faster currents. It has a supple, super-smooth finish on floating section and a 10’ fast-sinking tip. Type 6 Sink Rate: 6-7 IP. The Ghost Tip 15 is a clear, 15ft intermediate tip line that’s ideal for fishing lake depths from 5 to 15 feet.It has a high floating running line with a tip that has a sink rate of 1.5 - 2 IPS .Cortland 444 Classic Sink Tip 3 Fly Line offers the added benefit of an integrated 10 foot type 3 sinking tip. The weight forward design is easy casting while the supple, glass smooth finish of the 444 Classic allows the angler to easily mend and pick up line quickly while still keeping your fly down where the fish are feeding. Cortland's 7ft Clear Camo Tip is designed to be fished in the top two feet of water over weed beds and along shorelines when pupa, emergers or actively swimming nymphs bring trout up. The XS Intermediate Sink Tip is a line which exhibits superb casting performance with a 13ft intermediate density sink tip which will hold sub-surface, giving straight line contact with the fly to avoid missed takes while depth control is achieved through speed of retrieve. Ideal for serious trout and sea trout anglers. The Countdown S2-7ST comes in a pastel shade of primrose, this is the slowest sinking option in the series. With a 7ft clear tip, and super slick XS-Plus Nano coated and low stretch monofilament core, the line is well equipped for extreme casting and maximum sensitivity, just beneath the surface even at range.The Countdown S2-12ST has a longer sinking tip for reaching deeper and fishing a long slow nymph cast, but also handy for “washing line” and strip methods immediately sub surface.